What can San Jose’s minimum-wage increase tell San Diego? "Reese was born right here in the community, and he's worked for more than three decades on transforming urban neighborhoods into places for opportunities and jobs," Faulconer told the crowd. If approved by a two-thirds majority of the City Council, Jarrett will become Civic San Diego's next president. But rather than just fading away once the job of winding down redevelopment is complete, the roughly 30-person nonprofit and its new chief hope to stay busy luring investment to large swaths of Encanto and City Heights. Top city officials continue to push a complex and yet-to-be fully disclosed plan to use tax-break incentives and a stripped-down environmental-review process to convince banks and developers to invest in such under-served neighborhoods. "We're going to attract capital investment, stimulate growth and job development," Jarrett said at the news conference. "We're going to revitalize neighborhoods." Civic San Diego's former president, Jeff Graham, spearheaded the development idea before abruptly leaving to work for real-estate company Jones Lang LaSalle. Negotiations with the Municipal Employees Association, the union that represents the city's white-collar employees, continue over whether Civic San Diego can take over permitting and planning authority from city workers for these areas. But Faulconer and the City Council will have the final say. Details of the plan are still under wraps, but, generally, Civic San Diego would operate in these neighborhoods the way CCDC formerly did in Downtown, with the authority to plan and permit public and private developments. Using what are known as "programmatic environmental-impact reports," Civic San Diego could allow developers to largely skip full environmental review if their projects meet pre-approved guidelines. To make the deal sweeter, Civic has secured millions of dollars in tax credits for banks and businesses willing to participate. The credits carry the requirement to provide community benefits, but the definition of such can be liberally interpreted. That means the president of Civic San Diego would have extensive power to determine what gets built—whether it’s low-income housing or subsidized office space for community nonprofits or big-box retail stores. Given the mayor’s staunch pro-business politics, the selection of Jarrett isn’t surprising. The 63-year-old Bankers Hill resident has had a long career as a lender and developer and briefly worked for the city. Suggesting a conservative bent, Jarrett contributed financially to Faulconer’s recent mayoral bid, as he did to Republican Brian Maienschein's state Assembly campaign in 2012 and to an issue-oriented political action committee set up by then-City Councilmember Carl DeMaio. Somewhat surprising, then, was the enthusiastic support from District 4’s left-leaning City Council member, Myrtle Cole, who glowed as she announced Jarrett’s nomination. "Today, I'm proud to stand with Mayor Faulconer to announce a key appointment in developing areas like this in my district,” she said. “Our new leader of Civic San Diego, Reese Jarrett, is a native San Diegan... [and] has a long history in this community." Cole was part of a five-person hiring committee that also included Civic San Diego Board of Directors Chair Cynthia Morgan, Civic San Diego interim President Andrew Phillips, the Mayor’s Deputy Chief of Staff for Community Engagement Felipe Monroig and James Lawson, a member of the Downtown Community Planning Council. The committee plucked Jarrett from a pool of 85 applicants. As a boy, Jarrett lived with his family in southeastern San Diego until moving to the Midway / Sports Arena area to be closer to the North Island Naval Air Station, where his father worked as an electrician on airplanes, he told CityBeat. Despite the move, he continued to go to middle school in his old neighborhood, eventually graduating from Lincoln High School. He attended the University of Redlands and earned a degree in business before returning to live in San Carlos and work for the now-defunct Great American Savings and Loan. "I had felt that I had done the best that I could do at the time, and I was looking for another career opportunity," Jarrett said. After the stint in government, Jarrett started a development company called E. Smith and Co. and became a partner of Carter Reese and Associates, which has built projects in Encanto and North Park. In 2000, he developed the Mission Hills Commons, which he told CityBeat was an example of his best work. The mixed-use apartment complex offers 868-square-foot, one-bedroom, one-bath units that currently rent for $2,000 a month. In 2002, the Black Contractors Association of San Diego named Carter Reese "Urban Housing Developer of the Year." However, controversy struck in 2005, when then-City Councilmember Tony Young fired his chief of staff, Tommy Hightower, for soliciting loans from community members, including $2,000 from Jarrett. The City Attorney started an investigation that resulted in Hightower doing probation for two misdemeanors. Then, in 2006, Voice of San Diego reported that a deal involving Carter Reese resulted in homes intended to cost roughly $181,000 going for about half a million dollars. Jarrett and his development company had entered into a contract with his former employer, SEDC, for a $210,000 loan to build the Village at Euclid, a 23-home affordable-housing development. As a result of unenforced price caps, Carter Reese pocketed an extra $72,000, according to the report. Jarrett declined to comment at the time. But questions surrounding financial matters have persisted for Jarrett. Since 2008, he has been involved in at least three breach-of-contract lawsuits, one of which was filed by the city of San Diego for failure to pay $4,990.86 in outstanding fees to the Development Services Department. All of the civil lawsuits have been dismissed without prejudice, meaning a payment agreement was reached but the plaintiffs reserve the right to bring the lawsuit back if the agreement is broken. In connection with a mixed-use affordable-housing project called The Renaissance at North Park, a mechanics lien for $1,845 was filed against Jarrett by OJ Insulation LP in 2008 that has yet to be resolved, according to the county Recorder’s Office. Jarrett has also had a number of state and county tax liens filed against him dating back to the '80s. Carter Reese and Associates and E. Smith and Co.’s business licenses were also suspended in 2005 and 2012, respectively, for failure to file an income-tax return and an outstanding balance, according to the state’s Franchise Tax Board. Jarrett faxed a document to the CityBeat offices on Monday stating that E. Smith and Co. was in good standing as of July 28 and included a note blaming the state for the error. A spokesperson with the Franchise Tax Board said the license was suspended for failure to file an income tax return and outstanding balance, but the suspension has since been reversed. In response to questions concerning lawsuits and outstanding debts, Jarrett declined to comment. There may be good explanations for a number of these issues. However, the Civic San Diego hiring process didn't include a public vetting. In an attempt to make the process more public, Civic San Diego Board Director Mike Jenkins proposed including two community members from City Heights and Encanto on the hiring committee, as well as an opportunity for the full board to interview the top three candidates. "I'm encouraging my fellow board members to weigh in on this process and come up with a process that is open and transparent and invites the communities that will be affected by this selection to participate in it," he said during a March 26 board meeting—the only public hearing on the hiring of the president. In the end, the board approved a resolution asking Faulconer for the chance to interview the top candidates and for a "community member" to be included on the hiring committee, with Board Chair Morgan downplaying concerns regarding community involvement. "We have received a lot of community input," she said at the March 26 meeting. "And what I spoke with the Mayor’s office about was letting him know that we were taking input today, that we’ve already had quite a bit of interest through email and other communications that have been sent." Faulconer declined the request for the interviews, and he appointed to the hiring committee James Lawson, a member of the Downtown Community Planning Council who lives in East Village and once served on Faulconer's City Council staff. At the same meeting, a discussion of the president’s salary was docketed for closed session. Open-government advocacy group Californians Aware threatened to sue, claiming the discussion would violated the Brown Act. "Why are we spending our resources trying to hide from the public what the process is," Civic San Diego Director Murtaza Baxamusa said. "If we were transparent, then we would be talking about in open session who this candidate is, what their qualifications are and getting input from those communities that this candidate will be working in. Instead, we’re going into closed session so that the public does not find out what we’re talking about." In response, the item was postponed until July 21. However, Californians Aware was not satisfied, pointing out that again the board was discussing salary during a meeting that was largely unknown to the public. "I believe your action today will provide the public with a great deal of mistrust and cynicism, and I believe that simply calling a special meeting a regular meeting will violate the Brown Act," said Californians Aware President Donna Frye. Baxamusa boycotted the closed-session discussion. Jenkins expressed more comfort with the closed-session item but warned of the need to maintain Civic San Diego’s reputation with the public. "I think it’s not inappropriate for us to meet in a closed session, to make sure that things are done properly," he said. "But I do think the meeting that we had last week looked suspicious." The tension over the hiring of the Civic San Diego president comes after a series of contentious debates about the role of the nonprofit—how it will spend its resources and what kinds of projects it will prioritize. With legal issues over planning authority yet to be determined and confirmation of the president still to go before the City Council, envisioning what sorts of projects Civic San Diego will produce seems premature. However, plans may be further along than they appear. After Monday’s news conference in Encanto, Charles Chamberlayne, the mayor’s spokesperson, mentioned offhandedly to CityBeat that a Walmart was being planned for the area. "Hopefully, it’ll serve as a catalyst, but it’d be great to see a rec center, too," he said. Update: Chamberlayne and mayoral spokesperson Craig Gustafson contacted CityBeat after the story was posted claiming that Chamberlayne said "Walgreens," not "Walmart." 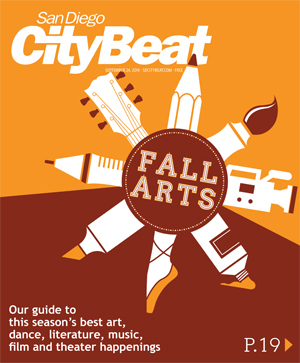 CityBeat stands by its account of what was said.